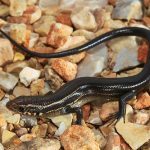 Skinks belong to the lizard family of reptiles with more than 1,500 recognized species. 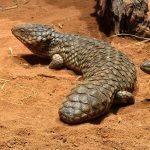 They are characterized by their short legs and apparent lack of a neck. 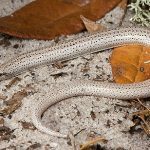 Some species have no feet at all. 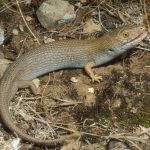 They move more like snakes than other lizards. 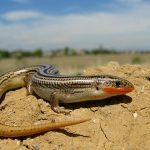 Skinks are mostly insectivores with their prey-base generally including grasshoppers, flies, caterpillars, and beetles. 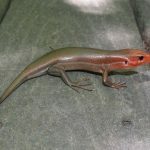 Some species may also feed on snails, millipedes, earthworms, isopods, and slugs. 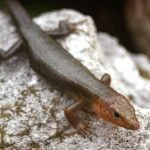 The skink family consists of oviparous, viviparous and ovoviviparous members. 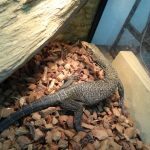 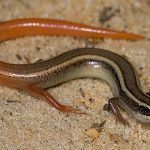 One of the most interesting adaptive features of skinks, which they share with geckos, is their ability to detach their tails from their body to distract any potential predator. 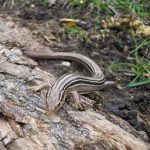 Skinks are largely active during daytime and spend their idle hours basking on logs and rocks. 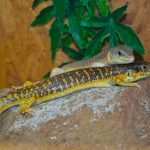 The largest known skink is the Solomon Islands skink, and it has a snout-to-vent length of 14 inches.